Network Ten has stunned many industry observers today by announcing Natasha Exelby has been sacked from its ailing breakfast television program Wake Up. Wake Up launched just 16 days ago after much publicity but immediately fell into a ratings hole averaging a mere 35k each morning. Exelby had been heavily promoted as the quirky country girl that "Australia would fall in love with" however since the launch of Wake Up she has generated much criticism from audience for her unusual conversation style. Viewers failed to warm to personal anecdotes of 'life on the farm'. She often appeared uncomfortable with the process of live television, often looked lost and confused during the fast paced program. Executive Producer of Wake Up, Adam Boland who himself took time away from the program last week due to stress issues is believed to have made the decision without interference from Ten Management. While in Vanuatu last week he took the time to clear his head and reassess everything about the show, and now back in charge he is acting quickly to turn things around. Wake Up will continue to be hosted by Natarsha Belling and James Mathison, with Nuala Hafner presenting local news for every state. Ms Exelby will remain with Network Ten's News division. 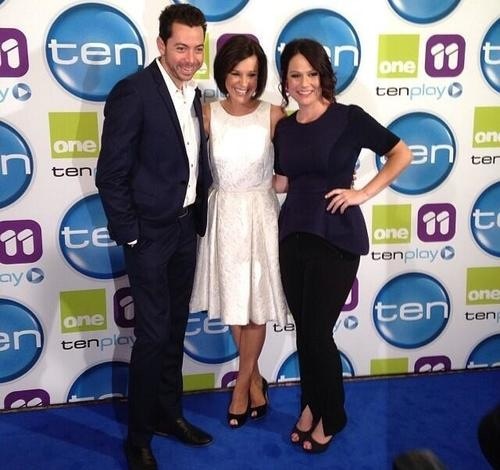 There will be no changes at Network Ten's new morning show, Studio 10. Network Ten Director of Morning Television, Adam Boland, said: "It's important we get Wake Up right. "I have said repeatedly that chemistry is everything at breakfast and, right now, I don't think the balance is correct. It's up to producers to fix those things. "I rate Natasha, Natarsha and James extremely highly individually, otherwise they wouldn't have been there in the first place. I also saw genuine spark during show rehearsals, but sometimes, that doesn't translate on air. That is nobody's fault, except mine," he said. "Natasha is a dear friend. She is also genuinely talented and will remain a key part of Ten into the future."